…Or as my friend Chelsea who works at Sofia succinctly said when I breathlessly ran into the store immediately afterwards to show the girls, “the best street-style photo ever taken in Chicago.” Credit doesn’t belong to me, it’s owed to entrepreneur Colette May of Kindle Communications and her superb taste in fashion. Besides, who else in the Windy City would pair Givenchy with sky-high simple Louboutins (the best kind!) and an Hermés Birkin bag for a leisurely stroll down Oak Street? Last year’s cornucopia of Givenchy prints accelerated designer Riccardo Tisci’s rise to the top. The Resort 2012 floral explosions were cheeky yet sensual, and belied an authentic sense of humor often missing from the corporate-owned houses. Perhaps that’s why Tisci’s Givenchy sits comfortably on the racks next to directional fashion innovators like Prabal Gurung, Rodarte, and Thakoon. At a time when so many other conglomerate brands struggle towards relevancy, Givenchy doesn’t need to rely on advertising dollars to ensure collections are included in influential editorials. The designs speak for themselves. I’m not one to post about recent purchases on my blog. I have nothing against those who do – anyone who is into fashion is inherently materialistic to some degree. The only thing worse than denying it is hypocritically railing against it, which is strangely common among fashion bloggers. Humans have been creating beautiful objects since the dawn of time so materialism in itself isn’t bad, although it seems to carry a negative connotation. Just think about how extraordinary the Venus of Willendorf and other prehistoric artifacts are! I think it’s when people sacrifice everything in their lives to the altar of capitalism and lose sight of themselves, giving up on cultivating a rich inner life through introspection and self-exploration, that it becomes a problem. Humans imbue objects with meanings that go far beyond their monetary values. In fact, the most meaningful objects in our lives have no monetary value; a letter from a close friend, photographs. I just think that generally speaking, what I buy is irrelevant in the context of this blog. Not so with my new Pamela Love 4-Tier Skull Necklace, which came courtesy of a gift card I received in the mail randomly from Barneys. Talk about a synchronicity. When I gleefully opened the piece of mail, shocked that it wasn’t a bill, I had no idea what was inside. The second I realized it was a gift card I knew what I was going to purchase. I’ve had my eye on Pamela Love’s jewelry ever since she was announced as one of the ten CFDA/Vogue Fashion Fund finalists. Her designs are a mix of the macabre and geometric; fractal-like triangles, bird skulls cast in silver, quartz crystals embedded in smooth metals. This necklace in particular reminded me of Hindu goddess Kali, or the red dakinis of Vajrayana Buddhism, so I knew I had to have it. 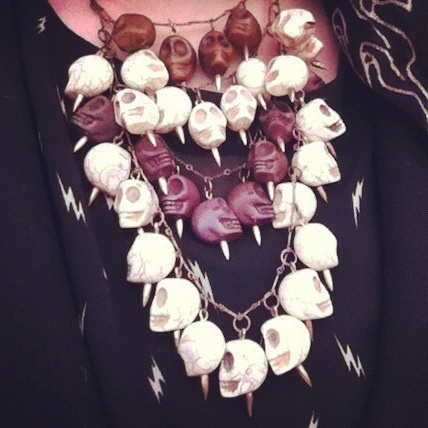 My love of skull jewelry only developed two years ago. I always thought they were creepy, and honestly kind of scary. Only after surviving an epic 45 days with appendicitis (it was misdiagnosed twice and required 3 ER visits… its a long story) did I become intrigued by them. In a strange way, it was only after being face-to-face with death that my fear of skulls was conquered. I’ve never heard of anyone surviving that long with appendicitis. It’s literally unheard of. If you’ve ever heard me say I have a “thing” for skulls, now you know why I wear them almost every day. My skull jewelry reminds me about the power of life to overcome seemingly insurmountable odds. 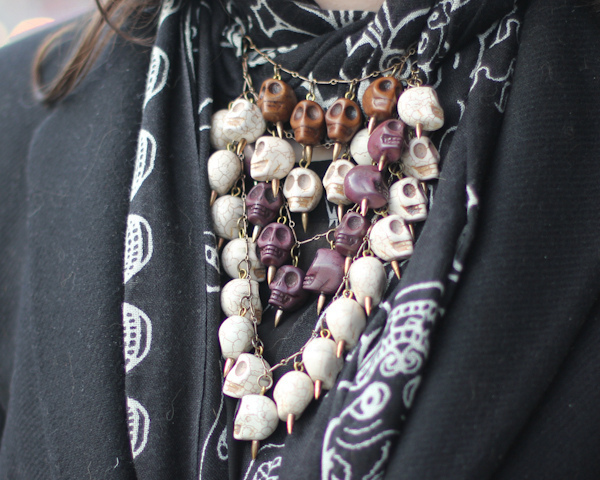 Skull necklaces are common in Hindu and Tibetan (Vajrayana) Buddhist iconography and represent impermanence, liberation, and the urgency of compassion. I love beautiful fashion just as much as everyone else, but the most important pieces in my wardrobe – a Suno dress given to me by a special friend, my Thakoon Masai dress – all have an extra layer of meaning. To photograph my new necklace I wore a sheer shirt with lightning bolts, one of the primary symbols of Vajrayana Buddhism. It’s from Forever21 and it’s fantastic. 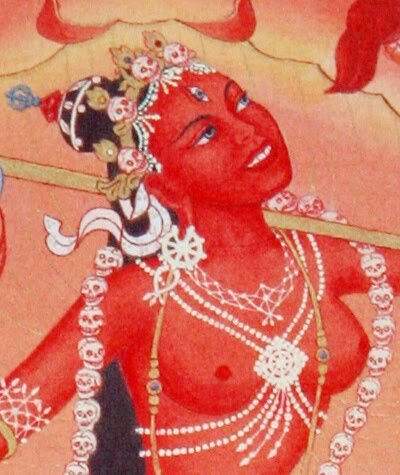 The root word vajra represents the indestructible diamond of enlightenment, which contains the essence of lightning and thunder. I’m also wearing my favorite scarf from We Are Owls, which is covered in Tibetan-style skull designs and mandalas. My array of skull jewelry acts as amulets, good luck charms, and brings a spirit of positive energy by continually serving as a reminder to me about what is truly important in my life (and it’s not things). To me, that is the most powerful form of fashion; pieces that resonate in a deeply personal place. EDIT: Thank you Pamela Love for re-posting this on your Tumblr! Where Do You Escape To? I know I’ve posted about the Baha’i Temple in Wilmette once before, but since it’s a spectacular place to visit in the Spring it bears revisiting (literally and figuratively). I hope everyone who reads my blog is lucky enough to have a place of refuge, and escape. We all need a sanctuary. I prefer public ones, like the Temple above, because I find strength in the idea that other people are sharing the same experience. It’s really cool that they let non-Baha’is like me hang out in the gardens and inside the temple itself. On a sunny spring day, the Baha’i Temple looks like what I imagine paradise to be. I want to hear from you all where YOU like to escape to! Maybe it’s one of the many hotels, restaurants, or casinos affiliated with Total Rewards, the loyalty program run by Caesar’s Entertainment? I’m especially curious to hear from my Chicago readers where your favorite spots to escape are. Maybe it’s Fred’s at Barneys, or a special spot on the shore of Lake Michigan. I want to know, so please leave a comment and tell me where you like to escape!